Last week was a whopper, here and on the home front. Plus, it's President's Day which means the little guy is home with me today, so I'll make this short and sweet and be back tomorrow with a new, non-Jack Kent review! 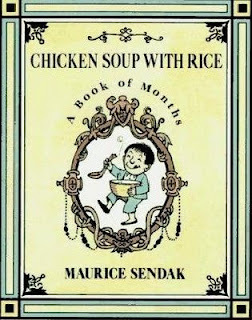 Up for grabs today, Monday... the day that I give away a new or old copy of a vintage book from my personal collection... is a nice nearly-new hardcover copy of Sendak's Chicken Soup with Rice. I bought it for a $1 last week at a used book shop, and it's in excellent condition. To be entered to win, all you have to do is leave a comment on this post between now and February 22, Sunday at midnight. As for last week's Jack Kent grab bag give... the winner is Margaret Perry. Congrats and send me your info to webe(at)soon(dot)com, and I'll get the books out to you ASAP... That's it, and see you back here tomorrow. Spouting chicken soup with rice! Oh, I remember this one from my own childhood! Love it once, love it twice--love it chicken soup with rice! My son is learning all the verses in daycare. Would love to have a copy at home so I can follow along! Remember this when I was a kid!! Love it! I would love to win this week's Great Monday Give! Maurice Sendak is one of my (and my kids') favorite authors/illustrators. We don't have this one yet! This is one we'd love to add to our library. Thanks for the chance! Count me in! Great book and great pictures. What a special book and a lucky find! Congratulations to the recipient. One of my favorites growing up. I love Sendak. I have the whole Nutshell Library from when I was a little girl. Still some of my favorite books to read to the kids. They were so little and fun. I also still love listening to Carol King sing as Really Rosie. So classic! Please don't enter me into the drawing. I'd love someone who doesn't own this book to have a chance to enjoy it as much as we do. i used to love this book! my parents used to read it to me when i was young, we don't have it anymore though. Gosh, I've totally forgotten about this book, and didn't realize until now it was a Sendak. Makes me want it even more now! Looks like another sweet one! Would love to add it to our collection... Thank you. p.s. congrats to the winner from last week! Chicken soup with Rice is nice! Pass some this way maybe! I loved this book as a kid--but I don't think I've ever shared it w/ my girls! I'll have to look at the library. Hi, Throw my name in the hat if you please. Yes, please! I gave my one copy away, thinking I had two. Thanks again for all the posts! Maurice Sendak is possibly my favorite children's book author! Sometimes I don't enter your Great Monday Give because I'm not that keen on the book or I think someone else's commnent is so touching that they deserve to win much more than me, but I really do love this one, so please throw my name in the hat! Please enter me for this interesting book! Please enter me in the drawing - my students LOVE Sendak! Oh, this is a favorite of mine!